When a seasonal market pops up in some sublime historical setting and contains eggs in a myriad of shapes, sizes and colours, then you know it’s Easter market time in Vienna. The first question many people ask about Vienna’s Easter markets is “are they as good as the Christmas markets?”. But how could they be? The Christmas markets are embedded in a city bursting with a wide mix of seasonal scents, sounds, lights and colours. Easter means there are more eggs and chocolate rabbits in the shops. No competition. Ask, though, whether it’s worth visiting an Easter market and the answer is yes. Just don’t compare them to the Christmas equivalents. In terms of what to expect, well, eggs for starters. Lots of them. Not tacky plastic ones or large chocolate ones wrapped in coloured foil, but decorative eggs – mostly hand-painted eggshells designed to hang on your Osterbaum (Easter tree). Otherwise, the Easter markets are essentially good quality arts and crafts markets, with a tasty dose of regional cuisine thrown into the mix. Even without the wintry ambience and Christmas punch, it’s nice to browse the stalls, sip a glass of Austrian wine and sample a wild boar sausage or a steaming bowl of goulash. The Easter markets tend to start around 2 ½ weeks before Easter and usually run through to Easter Monday. Opening times vary, but are commonly from mid-morning to early and mid-evening (6-8 pm). Saturdays, Sundays and the long Easter weekend, in particular, can get quite busy. I was at the Schönbrunn market, for example, on a Good Friday, which was delightful, but very busy. It was still easy to view the craft stalls, but there were queues for food. 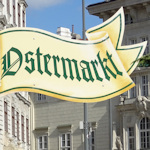 The Ostermarkt am Hof (April 5-22) scores points for artistic merit and culinary offerings. There’s a whole section devoted to artists and artisans, ensuring unique and original products for sale, while the food and drink stalls cater to a wide variety of tastes (but especially to those of us with a sweet tooth). The Ostermarkt Schloss Schönbrunn (April 6-23) has the best setting. It sits in the huge courtyard in front of Schönbrunn Palace, where Imperial children hunted for eggs in Easters gone by. Or probably not. Or, if they did, they presumably got their servants to do the hunting for them. The Altwiener Ostermarkt (Apr 5-22) also sits near the city centre, outside the Schottenstift monastery that dates back to the 12th century. This is where you get your decorative eggs, which are piled high toward the market’s middle at an open stall overflowing with the best efforts of chickens and artists. This Easter market is a little different because it’s inside and only lasts two days. The Oster-Erlebnismarkt gives you a taste (literally) of the province of Lower Austria, offering food, drink, arts, crafts, and music from the rural province.